Death*: She died on 1 February 1909 at Chicago, Cook, Illinois, USA, at age 38; Chicago Tribune, February 3, 1909, page 15. [S834] Baptisms 1855 - 1876, page 59, Honora Madigan Baptismal Record: FHL # 1752990, Salt Lake City Utah, September 25, 1870, St. James Church. [S420] Patricia Bulger, "Michael Madigan - Bridget Cherry Family Group Sheet", This sheet notes which vital records the compliler has located. [S792] 1880 U.S. Census, Illinois, Cook County, Chicago, Washington, DC, ED 38, Sheet 17, Line 35, Ancetry.com, accessed December 17, 2007. [S840] Carey-Madigan Marriage License: Micropublication #1030232, Family History Library, Salt Lake City, Utah. [S802] Chicago Tribune, February 3, 1909, page 15. [S779] Illinois Statewide Death Index (Pre-1916), Carey, Norah, Certificate number 2400. [S847] Nora Carey, Illinois Undertaker's Report of Death, Micropublication #1239809, Family History Library, Salt Lake City, Utah. [S58] Nora Madigan Burial Record, Lot 25, Block 6, Section R, Calvary Cemetery, Evanston, Cook County, Illinois, USA. [S800] 1900 US Census, Illinois, Cook County, Chicago, Washington, DC, ED 128, Page 15A, Ancestry.com, accessed December 19, 2007. [S852] Nora Hofelt, Illinois Certificate of Death, Micropublication #1852874, Family History Library, Salt Lake City, Utah. [S1201] Rita Lillian Hoefelt, Illinois Report of Birth no. 7803, FamilySearch.org, accessed May 26, 2010 (June 10, 1913). [S860] Hofelt-Madigan Marriage License: Micropublication #1030494, Family History Library, Salt Lake City, Utah. [S1422] Cook County, Illinois Marriage Indexes, 1914-1942, online www.ancestry.com, Leibach - Connor marriage, accessed October 25, 2011, www.ancestry.com. [S747] Illinois Statewide Death Index (1916-1950), online http://www.sos.state.il.us/GenealogyMWeb/idphdeathsrch.html, Nora Hofelt, Cert. # 6015747. [S814] 1930 US Census, Illinois, Cook County, Chicago, Washington, DC, ED 999, Page 4B, Ancestry.com; accessed December 22, 2007. [S125] Letter, Margaret Duffy to Elaine Watson, September 10, 1999. [S809] Letter, Mid-West Archives Limerick City to Pat Bulger, date unknown. [S576] Patrick "Harry" Madigan, Illinois birth certificate no. 76877, Family History Library, MF#1287845 (April 1, 1885). [S89] Patrick Madigan, Patrick Madigan, Death Certificate. [S841] Madigan-Clancy Marriage License: Micropublication #1030100, Family History Library, Salt Lake City, Utah. [S627] Illinois Statewide Marriage Index 1763-1900, online www.cyberdriveillinois.com/GenealogyMWeb/marrsrch.html, James Madigan and Margaret Clancy, License #00029782, accessed December 28, 2007. [S1140] Marriage Record: entry for James Madigan and Margaret Clancy, 4 February 1877 Nativity of Our Lord Church, Chicago, Illinois, Family History Library, MF #1763436, Item 2. Wilmette, Illinois Family History Library. [S627] Illinois Statewide Marriage Index 1763-1900, online www.cyberdriveillinois.com/GenealogyMWeb/marrsrch.html, Patrick Madigan and Bridget Thompson, Cert. # 34678; accessed December December 28, 2007. [S577] Marriage Registry: entry for Patrick Madigan and Bridget Thompson, February 24, 1878 Old St. John's Church, Chicago, Illinois, Family History Library, MF# 1612362. [S317] Soundex, 1910 Census, Illinois. [S236] St. James' Baptismal records, 1855-1911, Chicago, Illinois, Madigan, Mary F., Baptismal Record, April 20, 1879, Family History Library [FHL]. [S458] 1880 US Census, Illinois, Cook County, Chicago, Washington, DC, ED 42, page 24D, line 17. [S454] Ellen Madigan, Illinois birth certificate no. 5797 or no. 5197, FHL# 1287808 (2 June 1880). [S455] Ellen Sullivan, Illinois Medical certificate of death. [S454] Ellen Madigan, Illinois birth certificate no. 5797 or no. 5197, Occupation: Building house man (2 June 1880). [S458] 1880 US Census, Illinois, Cook County, Chicago, Washington, DC, ED 42, page 24D, line 17, (Ancestry.com http://content.ancestry.com/iexec/) Printout dated 16 August 2005. [S313] State of Illinois Death Certificate. [S894] Thomas Madigan, Illinois Birth Certificate no. 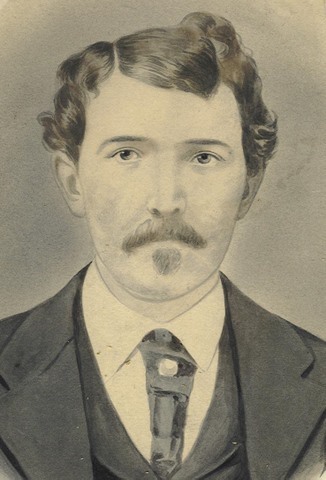 383731, pilot.familysearch.org, accessed February 12, 2009 (October 7, 1883). [S319] 1910 Census Soundex Record. [S912] "Harry Patrick Madigan WW II Registration card", Ancestry.com, accessed June 14, 2009. [S2181] U. S. Social Security Applications and Claims Index, 1936-2007, online www.ancestry.com, Harry P. Madigan, SS life claim 12 Dec 1952. [S936] Illinois birth certificate, John Madigan no. 10115 (May 6, 1887). [S17] Letter, John J. Madigan to Thomas A. Sullivan, 18 December 1972. [S934] Kathleen English Cemetery record, graves purchased April 23, 1901, Calvary Cemetery, Evanston, Cook County, Illinois, USA, Patrick Madigan grave, lot 2, block 26, section P.
[S2181] U. S. Social Security Applications and Claims Index, 1936-2007, online www.ancestry.com, John Joseph Madigan, original SS application. 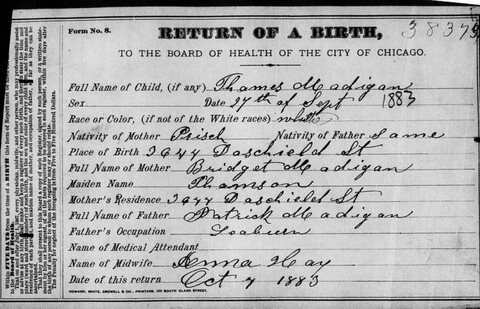 [S454] Ellen Madigan, Illinois birth certificate no. 5797 or no. 5197, MF #Unknown (2 June 1880). [S46] Patrick Madigan, Illinois Certificate of Death. [S791] 1880 US Census, Illinois, Cook County, Chicago, Washington, DC, ED 32, Sheet 12, Line 31, Patrick Madigan is listed as age 61 on 1880 US Census. [S948] Margaret Quinn, Illinois death certificate, Family History Library, Salt Lake City, Utah, MF# 1239881. [S791] 1880 US Census, Illinois, Cook County, Chicago, Washington, DC, ED 32, Sheet 12, Line 31, Ancestry.com, accessed December 17, 2007. [S779] Illinois Statewide Death Index (Pre-1916), Certificate #10291. [S787] Patrick Madigan, online www.findagrave.com, Accessed December 6, 2007, recorded by Carleen Malone August 28, 2006. [S848] Patrick Madigan, Illinois Undertaker's report of death, Micropublication #1239755, Family History Library, Salt Lake City, Utah. [S778] Carleen Malone, "RE: Madigan Cousin," e-mail to Elaine McIntyre Beaudoin, December 1, 2007. [S66] Michael Madigan Grave record, Calvary Cemetery, Evanston, Cook County, Illinois, USA. Residence*: He resided at Chicago, Cook, Illinois, USA, in 1917, at 3511 W. Fillmore Street. 1917 Chicago City Directory..
Several members of Ragen's Colts would leave to form the NFL football team the Chicago Maroons, later known as the Chicago Cardinals, in 1920. NFL logo For other uses of the abbreviation NFL, see NFL (disambiguation). ... The Arizona Cardinals are a National Football League team based in Tempe, Arizona. Biography: Ragen members could be secured to do "strong arm" work in the elections in other districts as well as the stockyards area. Hugh McGovern and John and Harry Madigan and John O'Brien kidnapped a Cicero clerk of election by the name of Joseph Rice and held him prisoner in a West Harrison Street saloon. The plaintiff charged kidnapping and assault to kill. The history of the trial of these four men is an interesting sidelight on the administration of the law. True bills were voted by the April grand jury in 1924. The case did not come up for trial until June, 1926. Critics of State's Attorney Crowe, who was elected in the primaries of the 1924, when so much violence was used in the elections, accused him of purposely shelving this case along with others that grew out of the 1924 elections. Just before the case was due to come to trial a new assistant prosecutor was assigned to it, in place of the one who had been familiar with the case from its inception. The men were acquitted of the charge although the defense had offered no closing argument and the assistant prosecuting attorney in charge had made only a brief summary of the case for the state. The prosecuting witness, who had positively identified his assailants as McGovern, the Madigan Brothers, and O'Brien two years before, refused in 1926 to say that these four were the kidnappers, and it was generally understood that it was for fear of his life. Biography: "Relations between Capone and the O'Donnells had deteriorated to the brink of open combat. The Irishmen grew daily bolder in their encroachments upon Capone's Cicero territory. Harry Madigan later explained to Chief of Detectives Schoemaker how matters had stood: 'When I wanted to start a saloon in Cicero more than a year ago, Capone wouldn't let me. I finally obtained strong political pressure and was able to open. Then Capone came to me and said I would have to buy his beer, so I did. A few months ago Doherty and Myles O'Donnell came to me and said they could sell me better beer than Capone beer, which was then needled. They did and it cost fifty dollars a barrel, where Capone charged me sixty. I changed, and upon my recommendation so did several other Cicero saloonkeepers.'" Biography: Harry Madigan ran an Al Capone-controlled bar called the Pony Inn at this location, 5613 W. Roosevelt, Cicero, in 1926. In Spring of that year, the sidewalk in front of the saloon became the scene of a famous crime that haunted Capone throughout the rest of his career. The building still stands, now know as Sarno's Restaurant. 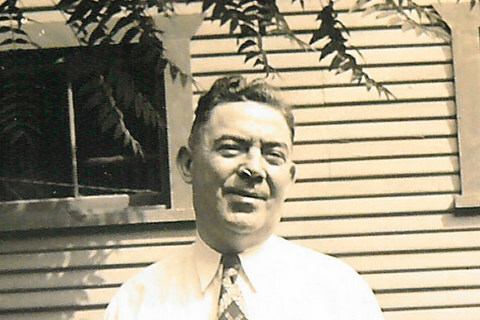 William McSwiggin was Assistant Statues' Attorney in Chicago, and had vigorously pursued an indictment against Al Capone in 1924 for killing Joe Howard in a South side bar. While unable to successfully prosecute Capone (despite the presence of several eye-witnesses), McSwiggin became known as a "hanging" prosecutor. But there was more to him than met the eye. McSwiggin was also a card player, gambler, and drinker, and that naturally brought him into close contact with Capone and his associates on a regular basis. In fact, with the passage of time, Capone began to consider McSwiggin a friend. One night in late Spring, 1926, after dinner at his parents' house, McSwiggin and a few close friends went out for a night of gambling and drinks. Shortly after leaving the house, their car broke down and they ended up joining a couple of other friends in their car. These friends were the O'Donnell brothers, rival bootleggers who had a growing feud with Capone. The O'Donnells' shiny new Lincoln went cruising through Cicero with McSwiggin and friends, hitting bar after bar, until they ended up here, at the Pony Inn, not far from Capone's Cicero headquarters. When word came to Capone that his rivals were encroaching on his territory, he sent a convoy of Lieutenants, armed with machine guns, to make his displeasure known. No one told him his friend McSwiggin was with the group. As the drinking party left the Pony Inn, bursts of gunfire sent fifty rounds into the group, killing three, including McSwiggin (the O'Donnells, the targets of the attack, escaped unharmed). Public outcry at the gangland death of a state prosecutor pushed the police into action. Chicago police invaded Cicero, arresting Ralph Capone and raiding several Capone-owned joints. Al fled the city, spending the summer of 1926 among friends in the Italian community in Lansing, Michigan, until the heat died down enough for him to return to the Chicago area. Never again, however, was Capone completely unmolested by the police. Though he had never intended to hurt McSwiggin, he had lost his standing with the public, who began to put increasing pressure on the police to shut down gang operations. --Harry P. Madigan of 221 S. Central Park avenue, beloved husband of Margaret Saunders Madigan, nee McHugh; brother of Nell Sullivan, Nan Rooney, John J., and the late Mayme Harvison (sic). At funeral home, 17 Madison street, Oak Park. Funeral Saturday, Dec. I, 9:30 a.m., to Our Lady of Sorrows church. Mass 10 a.m. Interment Calvary. Member of Pipe Fitters union, local No. 597. Note*: He Elaine M. Beaudoin interviewed Helen M. McIntyre regarding her Uncle Harry. E: What are your first memories of your Uncle Harry? How old were you? H: I was about four or five. We lived out west in the Austin neighborhood. Uncle Harry opened up a movie theatre on West Roosevelt Road. I would go there with my Mother and Father and see silent movies. E: Uncle Harry lived with Nana for some time. Do you remember visiting with him and Nana? Anything you remember about the visits? H: We visited Nana a lot but didn’t see too much of Uncle Harry. He seemed to be always working. E: When did Harry get his own place? Where did Uncle Harry live? Did you ever visit Uncle Harry’s home? What was his home like? H: He married Margaret Saunders and moved to an apartment at 221 S. Central Park. I visited a few times. It was a nice first floor apartment near Garfield Park. E: Uncle Harry owned several taverns. What were they like? Any stories about visits to the bars? E: Did Uncle Harry own any other businesses? What were they? Do you remember anything about them? H: He finally sold (the tavern) after several years. He thought the neighborhood was changing for the worst. He bought a new place out West but didn’t get as much business and missed his old friends so finally gave it up. I think he started off as a pipe fitter. E: There are articles about Uncle Harry in the newspaper when someone was shot outside one of his taverns. Do you remember anything about the incident? H: I remember Nellie and Aunt Mae talking about it. It was in the newspapers and sort of blamed Uncle Harry. Nellie and Aunt Mae were upset about it. One man was a gangster. He and another man had an argument at the bar. They went outside in the back yard and the gangster shot and killed the other man. E: Who did Uncle Harry marry? How old was he? What do you remember about her? Was she married before? Did she have any children with her first husband? H: Uncle Harry was in his fifties (when he got married). He married Margaret Saunders. He knew her for a long time. She was married before but her husband died. I think she had one son. E: Do you remember spending holidays with Uncle Harry? Which ones? Any particular memories about them? H: Uncle Harry seemed to always be working at his tavern. But lots of time my Mother, Father, Aunt Mae and I would go there to celebrate a birthday or holiday. E: What other stories do you remember about Uncle Harry? H: Not too much. He was nice but on the quiet side and very serious about everything. E: Do you remember him being ill? Or, his wake and funeral? H: He had low blood pressure and dropped dead on an “El” on his way home. I remember his wake. He is buried next to Nana in Calvary Cemetery. E: What funny things do you remember about Uncle Harry? H: Not too much. He was very serious and was always working at his tavern. E: Do you remember any sad times with Uncle Harry? H: Before he and Margaret Saunders got married, they were taking a ride. Uncle Harry was driving. He drove across an “El” track too late and the car was hit by an “El” train. Margaret had to have her leg amputated. Uncle Harry was really upset. E: Did your mother, Nell Sullivan, spend much time with him? What did they do together? H: Not too much. She saw him mostly when she and my father would go to his tavern on the weekend and have dinner and a few drinks. E: What else do you remember about Uncle Harry? H: Not too much. He seemed to be always at his tavern working. He always seemed quiet but very nice. E: Can you physically describe him? H: He was about five feet seven inches. Black curly hair, a bit on the plump side. Blue eyes and a nice smile. E: Can you describe his wife, Margaret? H: She was pretty and in her fifties. Curly gray hair; also a nice smile, about five feet four inches and also on the plump side. E: What else do you remember about Margaret? What was she like? [S457] 1900 US Census, Illinois, Cook County, Chicago, Washington, DC, ED 220, sheet 1A, ward 9, (Ancestry.com http://content.ancestry.com/iexec/). [S457] 1900 US Census, Illinois, Cook County, Chicago, Washington, DC, ED 220, sheet 1A, ward 9, (Ancestry.com http://content.ancestry.com/iexec/) Print out dated 17 August 2005. [S453] 1910 US Census, Illinois, Cook County, Chicago, Washington, DC, ED 660, sheet 6A, line 33, (Family History Library [FHL], Salt Lake City, Utah, MF# Unknown). [S937] Madigan, Harry, Saloon Application, April 19, 1917, Chicago, Illinois, #7/0035/01. [S929] "Harry Patrick Madigan WWI Registraton Card", Ancestry.com, accessed January 8, 2009. [S931] NationMaster.com, Accessed January 10, 2009. [S933] Illinois Association for Criminal Jusice in cooperation with The Chicago Crime Commission, The Illinois Crime Survey, http://homicide.northwestern.edu/pubs/icc/, Homicide in Chicago, accessed June 26, 2009. [S932] John Kobler, Capone, Accessed January 10, 2009. [S930] The Chicago Crime Scenes Project, September 30, 2008, accessed January 1, 2009. [S938] Chicago Tribune, March 20, 1929, page 2, ProQuest Historical Newspapers Chicago Tribune (1890-1984). [S794] 1930 US Census, Illinois, Cook County, Chicago, Washington, DC, ED 1048, Sheet 10A, Ancestry.com, accessed December 18, 2007. [S624] Bessie (Bridget) Madigan, Illinois Certificate of Death. [S913] World War II draft registration card for Patrick Harry Madigan , serial number 165874, Draft Board, Chicago, Cook County, Illinois. [S415] Chicago Tribune, 30 November 1956, online. [S879] Madigan-Saunders Illinois Marriage License: Historical Cook County Illinois Vital Statistics Online, accessed January 15, 2009. [S928] The Garfieldian, October 28, 1948, page 22, Newspaper Archive, accessed May 10, 2009. [S877] Patrick Harry Madigan, Illinois Coroner's Certificate of Death, Historical Cook County Illinois Vital Records Online, accessed January 15, 2009. [S415] Chicago Tribune, 30 November 1956, online, Record Number: 19561130dn117. [S935] Bridget Madigan Cemetery Record, graves purchased March 15, 1899, Calvary Cemetery, Evanston, Cook County, Illinois, USA, Lot 15, part of lot N, block 6, section Z. [S329] Interview,, Various dates Helen McIntyre personal knowledge, Elaine M. Beaudoin interviewed Helen McIntyre regarding Harry Madigan. Death*: She died on 31 January 1955 at age 70; Chicago Tribune, Wednesday, February 2, 1955, page 5. [S790] 1900 US Census, Illinois, Cook County, Chicago, Washington, DC, ED 127, Sheet 5, Ward 5, Ancestry.com, accessed December 17, 2007. [S793] 1910 US Census, Illinois, Cook County, Chicago, Washington, DC, ED 1404, Page 22B, Ancetry.com, accessed December 17, 2007. [S1753] Marriage Register: entry for Hugh F. McNally and Tinie Madigan, June 24, 1914 St. Leo the Great, Chicago, FHL# 1577894, Item 7, Family History Library, Salt Lake City. [S2029] 1920 US Census, Illinois, Cook County, Chicago, Washington, DC, ED 2003; roll 350, page 10B, Acessed Ancestry.com, March 23, 2015. [S849] Bridget Madigan, Illinois Certificate of Death, Micropublication #1877388, Family History Library, Salt Lake City, Utah. 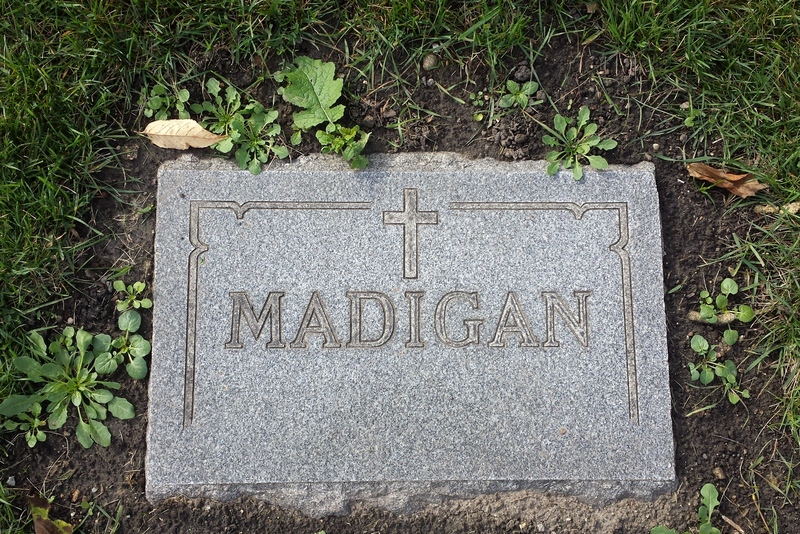 [S62] Michael Madigan Grave recording, Lot 25, Block 6, Section R, Calvary Cemetery, Evanston, Cook County, Illinois, USA. [S804] Chicago Tribune, May 1, 1923, page 10. [S1343] Chicago Tribune, June 5, 1940, page 24, ProQuest Historical Newspapers, Chicago Tribune (1849-1987), accessed February 2011. [S801] Chicago Tribune, February 2, 1955, page 5. Death*: She died on 23 November 1944 at Chicago, Cook, Illinois, USA, at age 56. Death Notice: Chicago Tribune, November 24, 1944, page 18. [S2221] All Saints' Parish, Ellen Theresa Madigan Baptismal Record: page 91. Acessed online FamilySearch.org, August 28, 2015, October 7, 1888, All Saints' Parish. [S855] Theresa Creed, Illinois Certificate of death, Micropublication #1983254, Family History Library, Salt Lake City, Utah. [S818] 1930 US Census, Illinois, Cook County, Chicago, Washington, DC, ED 985, page 1B, Ancestry.com, accessed December 20, 2007. [S861] Creed-Madigan Marriage License: Micropublication #1030527, Family History Library, Salt Lake City, Utah. [S817] 1920 US Census, Illinois, Cook County, Chicago, Washington, DC, ED 782, page 3B, Ancestry.com, accessed December 20, 2007. [S747] Illinois Statewide Death Index (1916-1950), online http://www.sos.state.il.us/GenealogyMWeb/idphdeathsrch.html, Theresa Creed, Cert. # 32352. [S808] Chicago Tribune, November 24, 1944, page 18. [S807] Chicago Tribune, September 15, 1949, Part 4, page 8. [S843] Theresa Madigan, Illinois Physician's Certificate of Death, Micropublication #1031444, Family History Library, Salt Lake City, Utah. [S779] Illinois Statewide Death Index (Pre-1916), Teresa Madigan, Certificate # 00013616 0 Don't believe this is the correct person, need to get death certificate. [S62] Michael Madigan Grave recording, Lot 25, Block 6, Section R, Calvary Cemetery, Evanston, Cook County, Illinois, USA, Lot 25 Block 6 Section R.
[S939] Thomas Madigan, Illinois death certificate, Family History Center, Salt Lake City, Utah, MF# 1033057. [S779] Illinois Statewide Death Index (Pre-1916), Thomas Maddigan (sp), Certificate #00012575, accessed July 6, 2009. [S940] Thomas Madigan Cemetery record, grave purchased March 15, 1899, Calvary Cemetery, Evanston, Cook County, Illinois, USA.